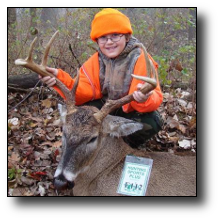 We had a very successful Youth Deer Season a couple weekends ago so I thought you might like to hear about it and see some pictures. My older son Drew (age 15) had plans at school, so my younger son Seth (age 9) and I headed out for the youth Deer opener on November 1st. We drove up to the Missouri unit we reserved early in the thick fog and once we got there we had to wait for the sun to come up a bit to see where we were walking. After we settled in to our spot we could only see a short distance in any direction. I knew any deer that might come our way would almost be right on top of us before we would see it. We whispered between us as he asked questions about the birds he heard and saw until he suddenly said "Whoa! A buck!!" I turned around to see a deer move behind a tree about 30 yards away. All I could see then were antlers on either side of the tree trunk. I handed him the gun and asked if he could see it in the scope. He said "No, I can't find it!" I tried to say calm when I told him to take his time but I was starting to shake. This deer was close and I was afraid it was going to see us and bolt at any second. He then told me he could see it but couldn't shoot because the tree was in the way. What seemed like several minutes but was probably just a few seconds, the buck just stood and tried to make us out. He must have thought we were nothing to worry about because then it quickly started to trot toward us at an angle. 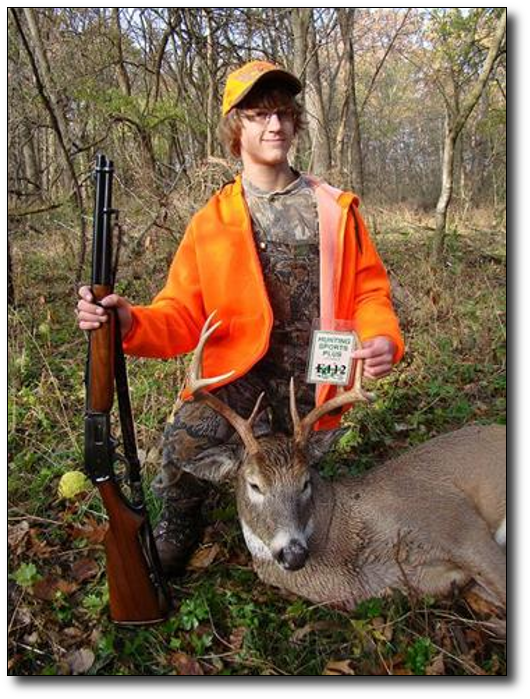 I just knew this deer was going to figure us out soon and take off so I told Seth to shoot if he could. No sooner did the words leave my lips when there was a loud "POW!!". The buck lifted its left front leg and took off running. I watched it for about 20 yards then lost sight of it and listened to it crash through the woods for a short time. Then silence. I was afraid I rushed him too much to shoot so I asked him if he thought he made a good shot. He said "I aimed behind the front shoulder just like you taught me." He was very confident that he hit it. Then he said "Dad, I'm shaking and I can't stop!" I said "I am too!" "Isn't it great!" He smiled the biggest smile I've seen in quite a while. We went back to my SUV and waited an hour just to be sure. He was so sure we would find it. I was starting to be a doubter. With the angle it was in and the fact that it was moving I was starting to worry. We finally went back and got to the spot where it was when he shot. No hair, no blood. We followed the trail it took and after slowly searching for 30 yards or so I only found two small drops of blood. I started thinking it was gut-shot and was afraid this would be an all day tracking ordeal. Then a slight breeze blew and I could smell a strong musky odor. "I can smell him!" I said. "I can too!" he replied. We walked a short distance over a small rise and there it lay. Dead as a door nail. He ran up to it and said "I told you I got it!" I felt very relieved and so proud. He shot it in the left shoulder, through the heart, and later when we skinned it we found the .243 bullet in the hide on the right side. It was a very large buck. The left brow tine was broken off making it a 7 pointer with a 17 1/2" spread. Early the next morning Drew and I drove through another pea soup fog to the same farm. I decided that we should hunt a small patch of timber on the opposite side of the field where Seth and I hunted the day before. We were entertained by numerous squirrels and a raccoon before we started seeing several does. They were too far in the thick brush to shoot so we just watched. After awhile a doe came through and I noticed she would walk about 20 steps then squat and urinate. Walk 20 steps squat and urinate. Occasionally she would turn and look over her shoulder at her back trail. She came to within 35 yards and Drew raised his gun. I softly said to him "Wait! I bet a buck is following her." Soon we heard a stick break. Then a buck emerged from the brush nose to the ground and grunting like a pig. When he came to the last spot where the doe secreted, he voided on the opposite side of a small creek. Drew raised the gun and the buck turned facing us and stared. I said "shoot him right in the chest!" I could hear Drew breathing heavy and could see the barrel of the 30-30 swaying. I was just about to say "take your time," when he pulled the trigger. At the loud report, steam blew from the bucks nostrils and he stiffed up and galloped away very straight legged. I knew he wouldn't go far. I turned to Drew and asked if he made a good shot. He looked a little worried and said "I don't know Dad. I was shaking so bad the barrel was all over the place. But when the sights were lined up on his chest I shot." I was pretty sure we wouldn't have a problem. After we waited a half hour we went to the spot where he last stood and found a great amount of blood and tissue. Drew felt a lot better and we quickly followed the wide trail of blood. It wasn't long when I spotted it piled up near a fallen log and it was all high-fives and hugs after that. It was a nice 8 pointer with a 14 1/4" spread. But not near as wide as the smile on our faces. Thanks to all of you at HSP for everything that you do to provide me and my family with the successes and great memories that we get by being members of the club.